This is the style guide for the wiki entries. It gives you examples of the different types of formatting used in this site. The normal text is called “Paragraph” in the styles. Please try your best to proofread for grammar and spelling. We can check each other’s work for this. It is important – because it is easier for non-native English speakers and those who do not speak English at all to translate these pages if they are more accurate. Explain common abbreviations before you use them. Avoid using Abbreviated slang such as “Avi” for “Avatar” or “Cam” for “Camera.” If a non-native English speaker is trying to translate the page, these words may be mistranslated, causing more confusion. Headings are important as they mark important areas of each article. They are important for human readability, and mechanical translation, and search optimization (also known as SEO). Please note that Heading 1 is used as the Page, Post or Wiki Title, so I do not use it much, as the size competes with the title. When you want to show that a word is a function, variable, event, or syntax (e.g. 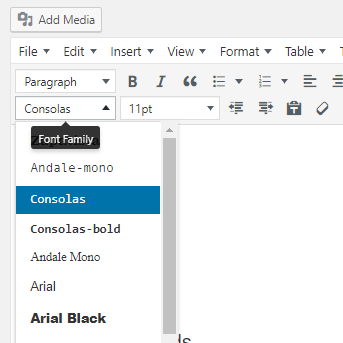 llSay() ), Use font Family Consolas. This helps with readability, and also with understanding automated translation. When I show the syntax on the first line of each term, I set the Tag to Heading 3, and then change the font to Consolas. In a future update, I will have this process be more automated. Agents that sit on the object, are linked to the object and are added to the end of the link set. See llGetNumberOfPrims for example functions. To paste code into the wiki entries, we need to place the cursor where we want the code block to be (do not paste yet), then use the code button in the toolbar which looks like this. Then, a popup will come up which will give you options. Change the language to LSL. This will give the code the proper syntax coloring and highlighting for you. Display Type – Most of the time (if not all) you want this to be “Block,” which is the default. Initial Visibility – If your code is under 30 lines, leave it as is, visible. If it is a long script (like Builder’s Buddy) Click “Hidden.” It won’t be truly hidden, just collapsed, so the entry is easier to read. Caption Text – If you want a caption, place it here. I do not use this very often. 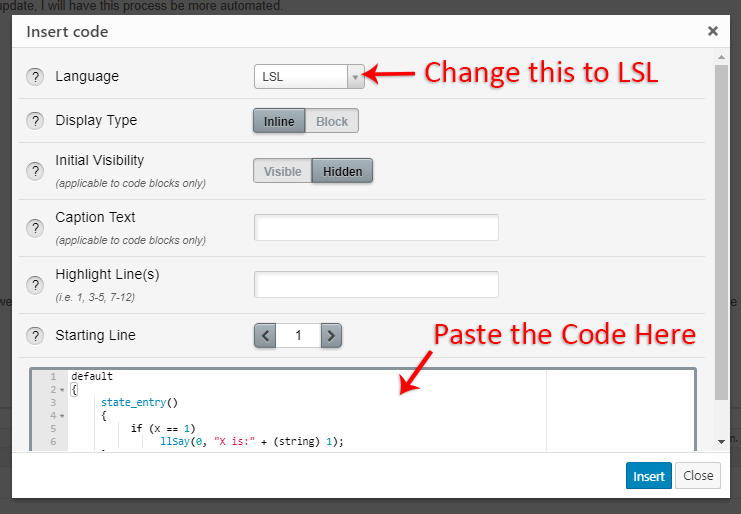 Highlight Lines – Use if you want to emphasize certain lines in a code snippet example. Starting Line – I usually do not change this – but if you are describing replacing code, you may want to. Delete the sample code and replace it with the code you want to paste in. Using this guide, we should be able to keep all our entries readable and concise. Thank you!